Describing Paul, I cannot only point to his qualities and successes as an athlete. As a rider agent, I have known and accompanied him for many years. Above all I appreciate his professional style as well as his openness of mind. These qualities are very important nowadays and because of them, Paul is well-liked not only by his friends, teammates and fans, but also by his rivals. Paul Martens is the German Oscar Freire at Blanco Pro Cycling Team. Fast in the sprint and hardly to get rid off in the ‘Ardennen’. The resident of Lanaken (Belgium Limburg) became 10th in the Amstel Gold Race of 2011, 10th in the Fleche Wallone and 13th in Liege-Bastogne-Liege. The German performed even better that year than in 2010 when he rode strong in the E3 Prijs (8th) and the Fleche Brabanconne (4th). 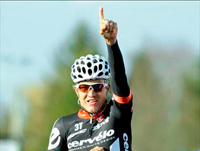 In Milan-San-Remo 2010 (15th) he also went over the Poggio with the best. After 2 broken ribs and a burst in his kidney he made a strong return in September 2010 winning the GP de Wallonie before Ricco and Evans. I already know Paul since our ‘youth-period’ (Under 17). The season 2003/2004 we were teammates for the U-23 ‘Bundesliga’ Team ‘ISPO Lotusan Cottbus’. In that period we got through a lot together and also enjoyed a few parties! His ‘Rap-sessions’ were legendary. It was always good fun with Paul. Even though we ride for different Professional Teams, we always keep in touch. I value his ‘ambition’ very much. When he sets goals, he goes for it 100%, no matter how hard the ‘road’ to get there is. I hope one day we can ride for the same Pro Team again!